Locally owned Auto Glass Professionals of Minneapolis & St. Paul is an auto glass repair and replacement company dedicated to providing hassle-free service to those with damage to their windshield and other auto glass. Auto Glass Professionals has recently moved to a new location to better serve their customers and provide convenient on-site replacement. They are now located off of County Road 10 and Highway 65 in Spring Lake Park. With their convenient mobile service, auto glass repairs can also be made at the home, office, or parking lot where the damaged car is parked. Part of their services include educating the public on the severity of damage to windshields, the danger of using do-it-yourself auto glass repair kits, and the importance of a timely repair. Auto Glass Professionals uses Sika’s MOVE IT urethane adhesive to offset the severe Minnesota weather. The adhesive provides the same one-hour drive away time at temperatures down to zero degrees F.
Auto Glass Professionals offers competitive pricing, in addition to a lifetime warranty with all auto glass replacements. They handle auto windshields as well as rear glass, truck topper glass, and door glass. The company has a history of treating clients like family members, working hard to reduce the stress of dealing with a damaged vehicle. Taking care of the finer details, speaking with insurance companies on behalf of the car owner, and offering mobile services at a convenient, safe location are all services offered by Auto Glass Professionals. Auto Glass Professionals is one of the only glass replacement companies in Minnesota that offers bilingual services for Spanish speaking customers. 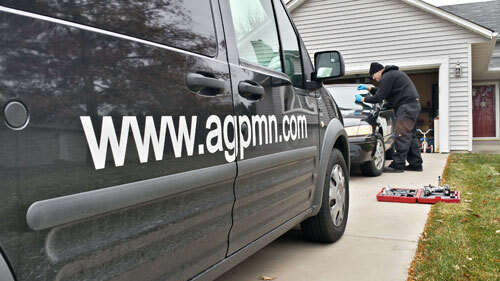 Auto Glass Professionals operates agpmn.com, Minneapolis’ leading source of information for auto glass repair and replacement, empowering customers to make educated decisions about their windshield repair and replacement. The AGPMN.com website makes it easy to get a quote online or get in touch with an agent. Auto Glass Professionals is based in Spring Lake Park, Minnesota.